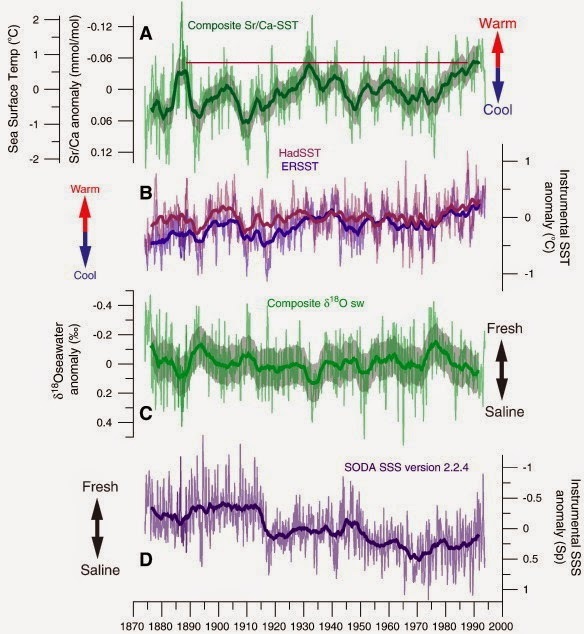 A paper published today in Palaeogeography, Palaeoclimatology, Palaeoecology reconstructs sea surface temperature changes since 1874 from corals located in the eastern equatorial Pacific Ocean. Data from the paper shows temperatures around ~1930 were about the same as at the end of the 20th century, and only ~0.25C warmer than in ~1885 [shortly after the end of the Little Ice Age] near the start of the reconstruction. "The interannual and decadal variability in Clipperton coral...demonstrates strong coherence to the [natural] Pacific Decadal Oscillation and the El Niño/Southern Oscillation (ENSO) with reduced ENSO variability from 1920 to late 1930s and enhanced variability in the late twentieth century." The reconstruction is also compared to instrumental sea surface temperature observations [most of which were made with crude measurement methods and questionable adjustments] which show warming of 0.5C-0.75C over the same time-frame, potentially indicating an upward bias of man-made observations in comparison to a uniform proxy temperature reconstruction. Where have we seen that before? Top graph is the coral proxy temperature reconstruction, with added red horizontal line to show temperatures were approximately the same around 1930 as at the end of the record, and only ~0.25 warmer than in ~1885. Second graph shows 2 instrumental records, which do have issues. Multi-coral composite Sr/Ca-derived SST demonstrates improved SST reconstruction. Advocate reproducibility method to discern possible anomalous coral records. Eastern Pacific coral Sr/Ca records indicate strong coherence to ENSO and PDO. Sub-seasonally resolved and replicated coral Sr/Ca time series at Clipperton Atoll (10°18′N, 109°13′W) in the eastern Pacific are assessed as a sea surface temperature (SST) proxy in this region with small seasonal SST variability. The composite coral Sr/Ca time series is a partially replicated record of three live and one sub-modern colony of Porites lobata extending back to 1874. Large inter-colony coral Sr/Ca offsets equate to relative SST differences of 0.6 to 4.3 °C and limit the ability to reconstruct absolute SST changes. Moreover, the replication method revealed a 12-year section of growth in one colony where mean Sr/Ca was anomalously low (~ 1 °C higher SST) relative to the other colonies without evidence of diagenesis or other significant skeletal alterations. The presence of this anomalous interval supports the need for multi-coral Sr/Ca replication in specific sites or regions. The Clipperton Composite Sr/Ca anomaly record is significantly coherent (r = 0.71–0.76, p < 0.001) with gridded instrumental SSTs but with larger amplitude decadal variance that appears to more accurately represent actual SST variability at Clipperton. The amplitude of the secular warming trend during the last century at Clipperton is 0.3 to 0.6 °C larger (~ twice as large) than the trend in the poorly “ground-truthed” instrumental SST records for the region. The interannual and decadal variability in Clipperton coral Sr/Ca demonstrates strong coherence to the Pacific Decadal Oscillation and the El Niño/Southern Oscillation (ENSO) with reduced ENSO variability from 1920 to late 1930s and enhanced variability in the late twentieth century.